We’re finishing my parents’ lake house master bathroom for the Spring One Room Challenge! Come see how my parents are hacking some Ikea kitchen cabinets into a beautiful custom vanity for their space. It’s One Room Challenge time again! This time, my parents are finishing up their beautiful lake house master bathroom over the course of the six weeks! 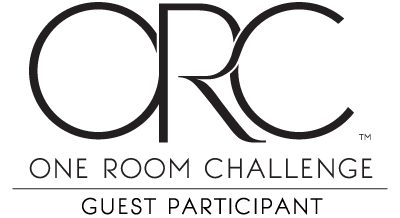 I’ll be sharing our progress along the way, and on May 9th make sure to stay tuned for the final reveal of the room. Have you seen my parents’ beautiful lake house? You can read all about it right here. Last week, I introduced the space to you and shared the Classic Cottage Master Bathroom design plans and mood board. Today I’m sharing an update on how the bathroom is looking so far and how my parents are creating a vanity from Ikea kitchen cabinets! 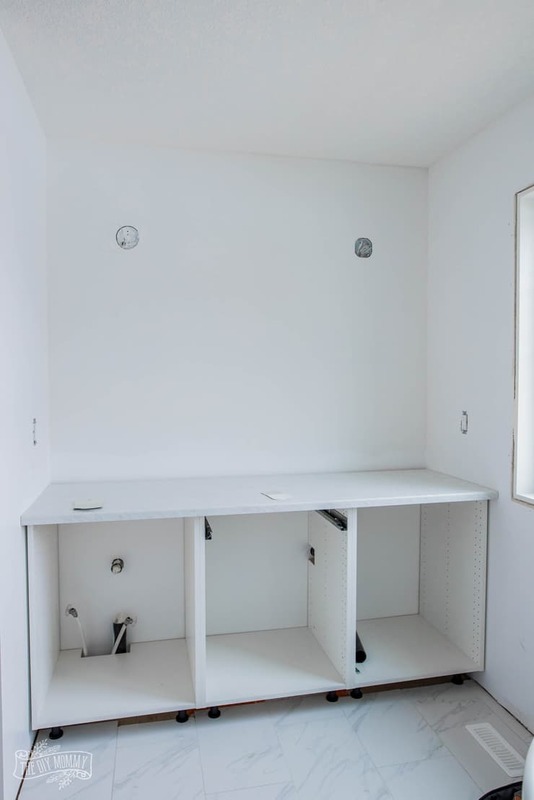 My mom researched a ton of options for their 6′ wide bathroom vanity, and ultimately decided that customizing some Ikea kitchen cabinets was a cost effective way to go. Mom & Dad cut Ikea kitchen bases back 2 1/8″ to make them vanity depth and still be able to accommodate the full Ikea kitchen drawers. 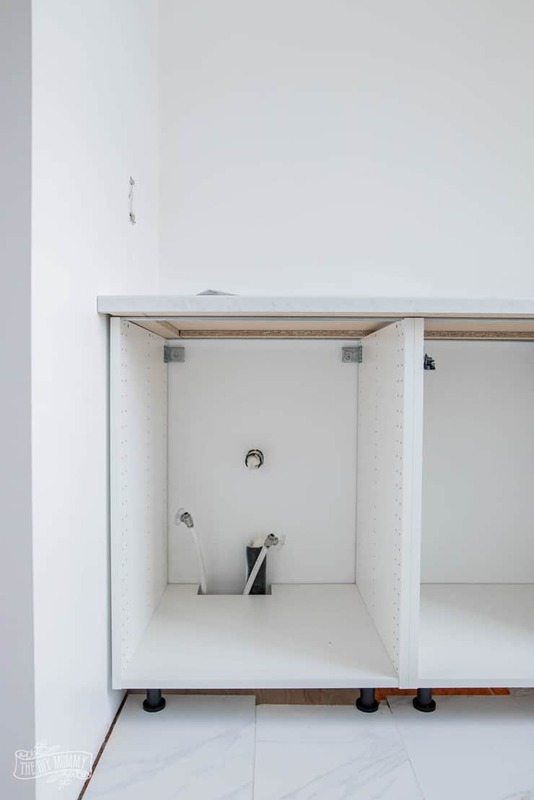 The wall behind the cabinet was also painted, and the cabinets were installed and modified for the bathroom plumbing. 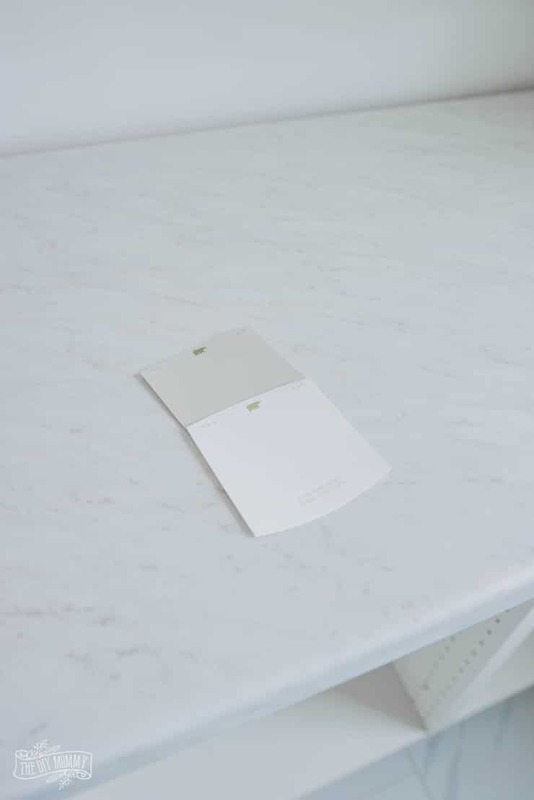 After that, my parents were able to measure and order a gorgeous Wilsonart White Carrera laminate countertop (from PF Countertops in Edmonton). The eased edge and beautiful design of this counter looks just as pretty as quartz or marble, but it’s at least a $1700 savings in cost! To continue the budget friendly theme of this renovation, my parents decided to spray paint some discount 100% Ikea doors for the vanity, and they’re deciding between painting them this lovely warm grey (Behr Dolphin Fin – top paint chip) or white (Behr Ultra Pure White – bottom paint chip). What would you do? Here are some doors Mom’s already spray painted in the grey for their other bathroom. It’s definitely soft and pretty, but white is always a classic! Also completed this week? 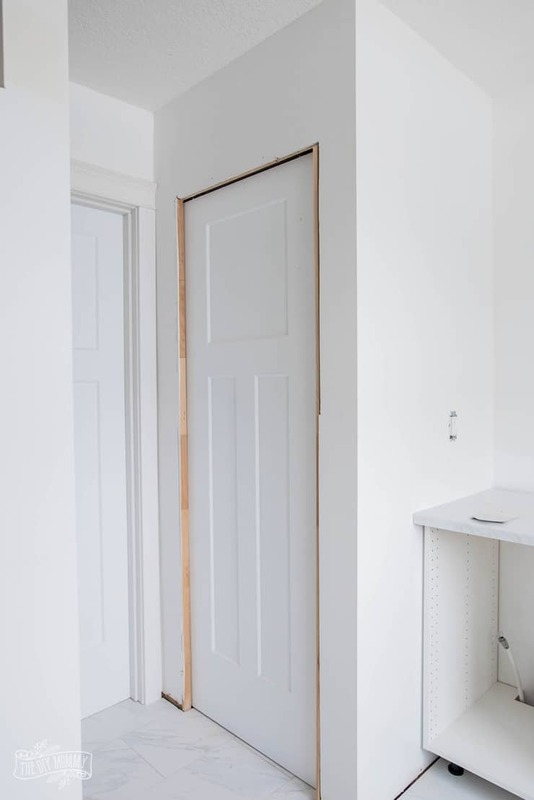 A pocket door to the toilet room was installed along with a door to the walk-in closet. Now, we’re ready to plumb in sinks and spray all the cabinet doors! Now tell me: What do you think of the bathroom so far? What colour would YOU paint the cabinet doors? 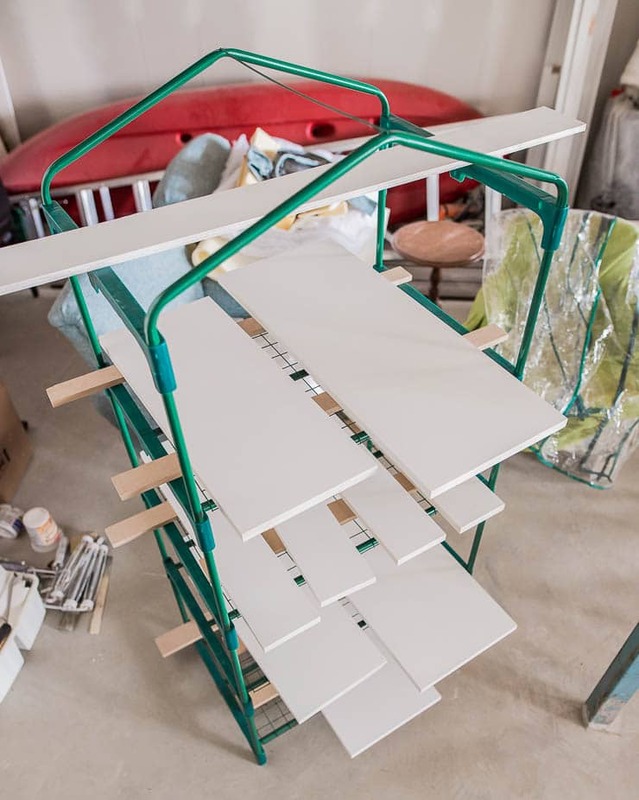 Make sure to follow along here on the blog every week as I share the progress of the space, and make sure to visit the Spring 2019 One Room Challenge link-up to see what all of the other designers & guest participants are doing this season! I love getting inspiration from everyone as they work on their spaces over the course of the six weeks. « Our 2019 Porch Decor with DIY Ideas for Spring! Yay for pocket doors! I wish every door was a pocket door! They definitely come in handy! Love a good IKEA hack! Really excited to see this room come to life.